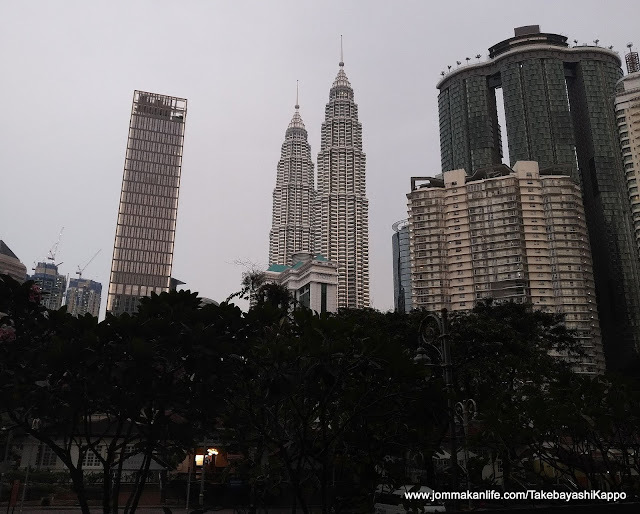 In Malaysia, Takebayashi is the first of its kind — a Japanese restaurant specialising in Kappo-style cuisine. 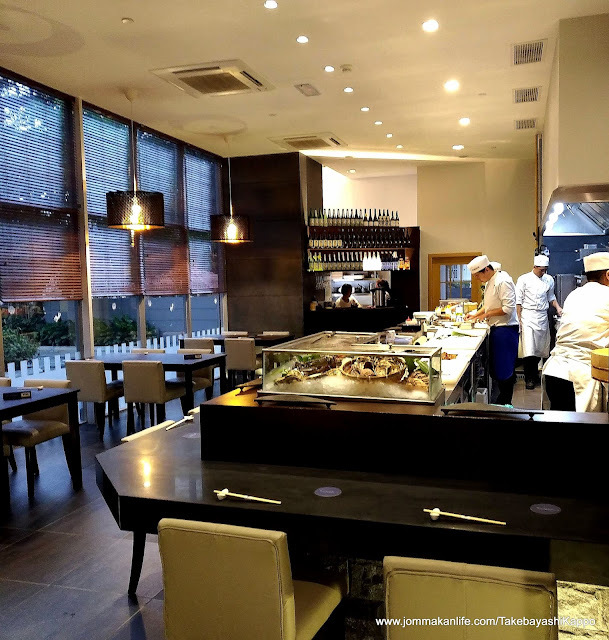 Opened in September 2018, this Zen-like culinary temple has Chef/Managing Director Tatsuo Takebayashi as the central commanding figure, impeccably suited in chef whites and colourful camouflage pants. 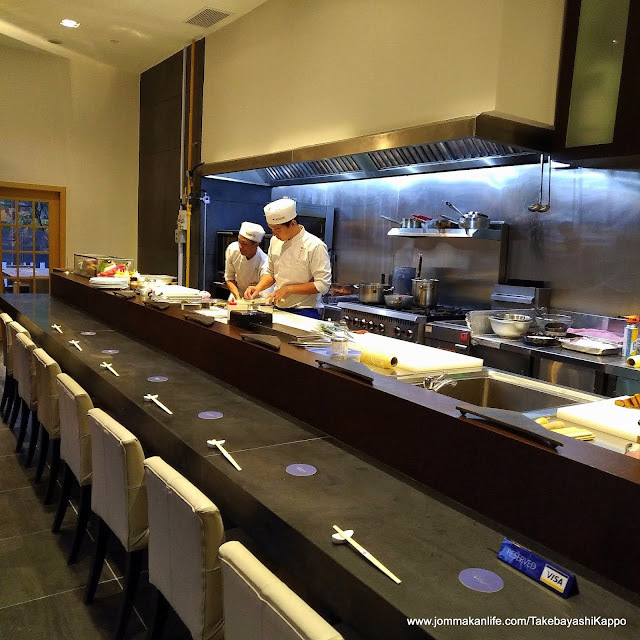 According to Takebayashi-san, Japanese Kappo can be defined as a multi-course meal prepared by the chef in front customers and served directly to them. The small and intimate ambience enables customers to see each dish being prepared using the freshest, seasonal ingredients in close proximity at the kitchen counter. Everything is above board with no holds barred on hygiene and chef-customer interaction. Having garnered stellar culinary credentials including past stints at NOBU in the US of A, Malaysia and Montenegro, Japan Airlines’ in-flight catering company and Crystal Cruise, Takebayashi is now charting a new course as the captain of his own Kappo Restaurant at The Ritz-Carlton Residences. Located in a discreet corner of the towering high-rise, the tactile wood and slate grey interior is dominated by a long countertop where the restaurant team holds court. 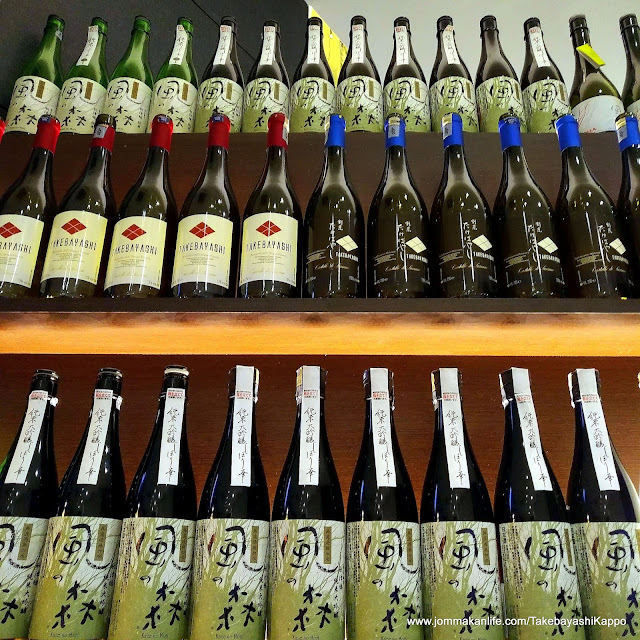 An overhead display of house wines and Japanese spirits coupled with warm, ambient lighting gives the restaurant an austere yet cosy feel. A private room with six seats accord those seated within a stunning view of the iconic Twin Towers. Set meals (RM50 onwards) and sushi rolls (RM40 onwards) are mainstays during lunch hours. 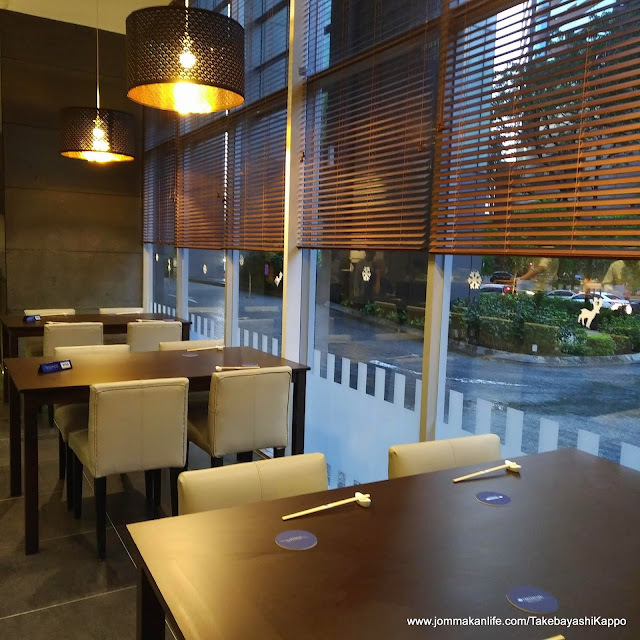 Dinner is the best way to experience Takebayashi Kappo as the culinary team will have ample freedom to impress through an Omakase menu (RM280 per person) comprising Zensai (appetiser), Sashimi, Agemono, Charcoal Grill, Sushi, Soup and Fruits. The current menu is a work-in-progress, to enable Takebayashi ascertain the types of dishes that appeal to his clientele. Our dining experience got off to an orgasmic start with the chef’s simple but ingenious Cream Cheese with Miso (RM30) appetiser. Marinated in miso for 3 days, the nondescript tiles of cream cheese came lightly grilled under a salamander prior to serving. The resultant sensuous creaminess coupled with the Japanese beanpaste’s seductive savouriness literally knocked our socks off. Hot on the heels of that show-stopper was the second appetiser, Cold Tomato with Umami Jelly (RM45). Skinned and cut into quarters, the red Japanese tomato came surrounded by clumps of crystalline konbu-dashi flavoured jelly. 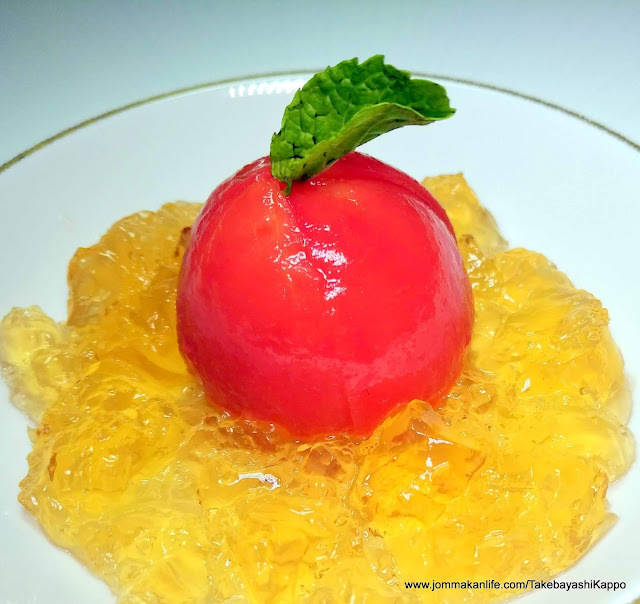 We detected the barest tinge of honey sweetness as we nibbled on the fruity tomato before the umami taste resonated across our tastebuds when the soft jelly melted on the palate. From the Cold Dish section, Chef Takebayashi tempted us with White Fish with XO Salsa (RM60). In this instance, the serving of Kinmedai (splendid alfonsino) was artfully sliced and dotted with tiny dollops of his XO salsa: a zippy mixture of dried scallop, garlic, spring onion and fried shallot amidst the mild tanginess of ponzu sauce. It was a joyful flavour party in our mouths; the fish's unadulterated sea-sweetness punctuated by faint bursts of punchy onion-sharpness. 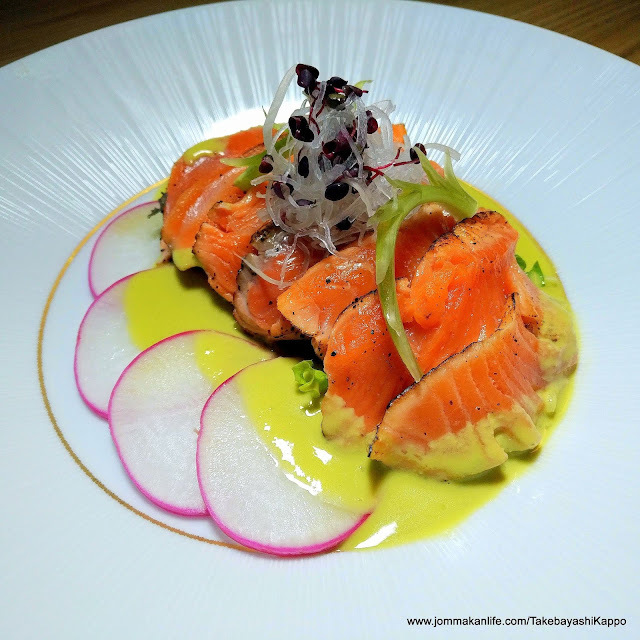 We also fell hook, line and sinker for the house speciality of Salmon Tataki with Jalapeno Sauce (RM50). Such a mind-bogglingly simple creation but one that left an indelible impression, thanks to the unmatched pairing of lightly seared succulent Norwegian salmon slices with creamy, wickedly robust jalapeno sauce. 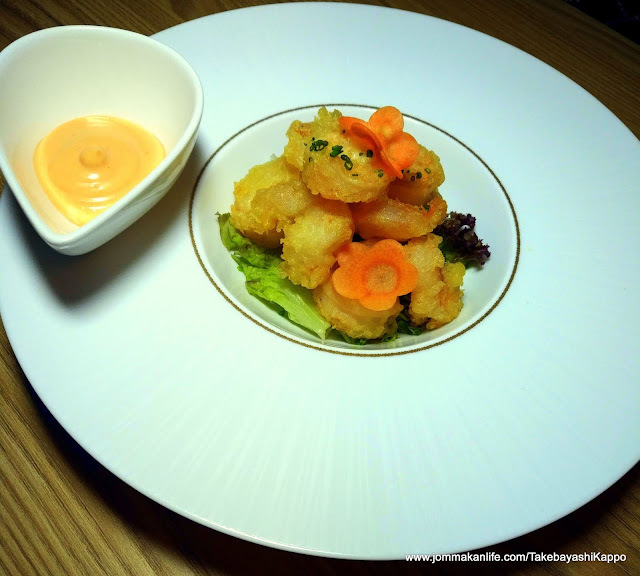 Crispier texture piqued our interest in the form of Popcorn Shrimps with Spicy Mayo Sauce (RM45). The airy-light batter coating the curls of springy shrimp were most addictive and when dunked into the mayo dip, truly hit the spot. Executive Chef Jhon Chang also proved his sushi-making prowess when he conjured up two varieties of Sushi: Toro (5 pcs RM190) & Aji (5 pcs RM40) for our dining party. The raw fish slices were sizeable atop clumps of vinegared rice. 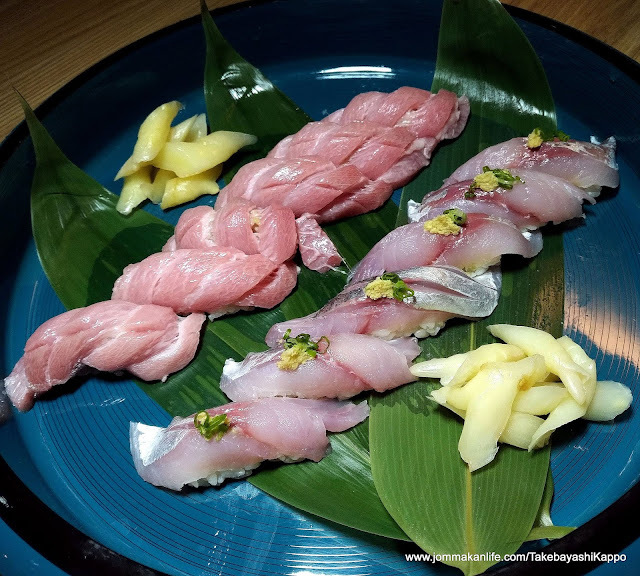 Complemented by house-made pickled young ginger that suffused our tongues with warm sweetness and the bracing spiciness of freshly grated wasabi, every piece was an epicurean treat. Sometimes a testament of a good Japanese restaurant lies in its most basic offerings. At Takebayashi, the slippery smooth and savoury rich Chawan Mushi with Dried Scallop Sauce (RM45) underscores this maxim. Topped with shredded dried scallop, the silky egg custard had plenty of textural surprises: ginkgo, chicken, prawn and a square of yomogi (Japanese mugwort gluten) embedded within it to tantalise us. Playing his role as the perfect host to the hilt, Chef Takebayashi also plied us with his eponymous wine by Castello di Luzzano Lolli Piacentini Malvasia. The semi-dry Italian sparkling wine brimming with bright, effervescent fruity-herbal notes went like a dream with most of the dishes we had savoured including Grilled Spring Chicken with Wasabi Pepper Sauce. 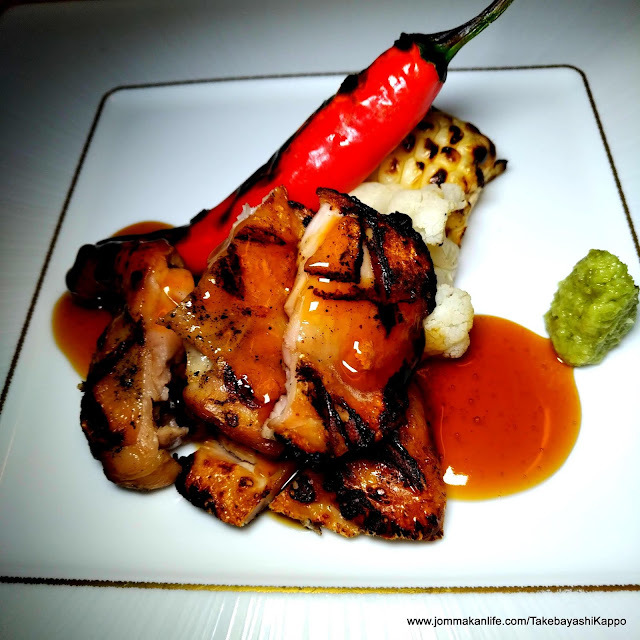 The elegant wine did wonders in amplifying the enticing smokiness of the lean kampong chicken and the muted sweetness of the accompanying grilled white corn and cauliflower, touched with viscous barbecue sauce. 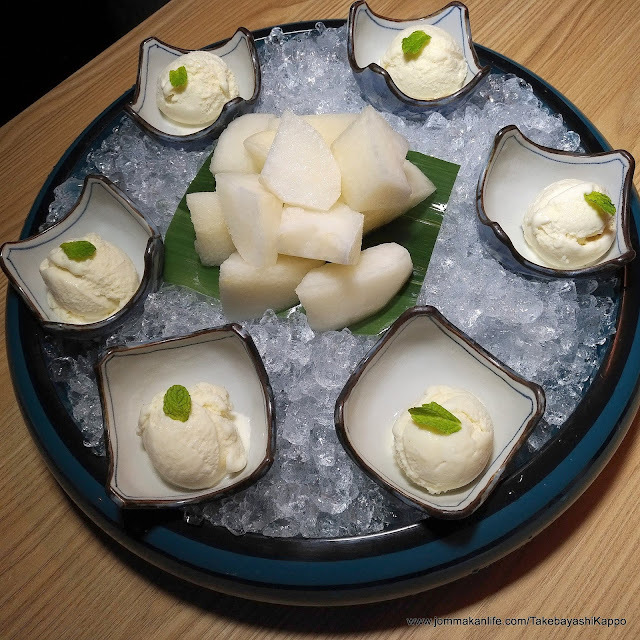 When it comes to dessert, the fresh, in-season Japanese Pear and Vanilla Ice Cream brought our hugely satisfying visit to Takebayashi to a rousing conclusion. 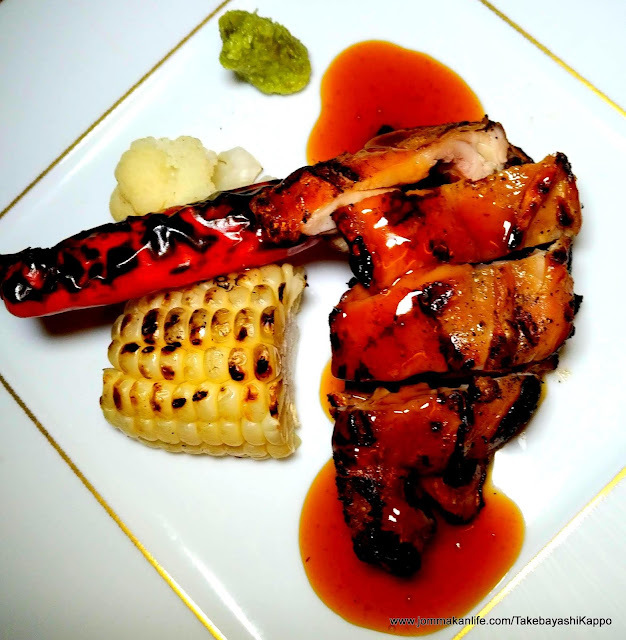 For reservations, please call Takebayashi Kappo, tel: 03-2181 3364. Address: Concourse Area, Level 1, The Ritz-Carlton Residences, Laman Sentral Berjaya, 105, Jalan Ampang, Kuala Lumpur. Business hours: Lunch Mon-Fri 12noon-2.30pm, Dinner Mon-Thurs 6.30pm-10.30pm, Fri & Sat 6.30pm-11.30pm.Closed for lunch on Saturday & whole day on Sunday. That really were some excellent looking sushi and the wasabi must be great! @KY - Can't fault the sushi. Fresh wasabi is always excellent hence the high cost.